Me vähän epäillään, että kylmän sodan aikaan itäblokissa oli eräänlainen Strichtarn-klikki, ja tähän kuuluivat Itä-Saksan lisäksi ainakin Puola ja Slovaknönnönnööt (Puola saattoi olla eka maa joka sitä käytti). Jos raidat kutkuttelevat, osta tästä lakki! Ei taatusti hajoa, toisin kuin näitä käyttäneet varusmiehet! Slovakialainen vanha kenttälakki on tosi kestävästä puuvillakankaasta kudottu lipallinen kotsa, jossa ei paljoa muuta mainitsemisen arvoista sitten olekaan, paitsi tietty noi jäätävän hyvän näköiset korvaläpät. Tsekkislovakioiden Strichtarn-kuviossa on usein villi mutta haalea kuplamainen taustakuvio tuomassa järkyttävän paljon lisäarvoa naamiotehoon. Jos se olis voimakkaammin esillä, sais kuviosta törkeen hyvän taustan esim. happorokkilevyn kanteen. Lakeissa joskus Slovakian inttihonor-merkki edessä. Ei aina. Parilla eurolla et saa kyllä valkkailla, osta useampi ja toivo parasta. Hyväkuntoista armeijaylijäämää vuosikymmenten takaa. Useimmat näyttivät ihan iskemättömiltä! These are real nice for when you're out camping, it sure covered a great deal of my neck and ears when the wind came around. 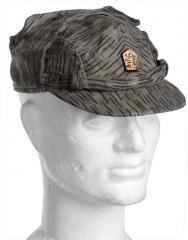 I'm guessing these are just Strichtarn versions of the Soviet field cap, not that it's a bad thing. I bought two (who can't afford one at this price?) one earlier and one later, as I didn't get the small band at the front for the first one but I got the insigna for the first one and not for the second one. Ostin 2 kpl:tta näitä siinä toivossa, että saisin kokoelmiin yhden siistin yksilön. Mutta sainkin kaksi susi huonoa. Ehkä seuraavalla kerralla sitten saan hyvän. While there are better caps, they dont go for a euro. I have four of these now, 3 were a perfect fit one was a bit tight but I took the ear flaps off so it fits nicely now. From the ones I received one looks to have genuinely never had a strap across the front, ones had it removed at some point and the other two had them fitted. Most of them come with a badge fitted from the looks of it, I've only recieved the one without a badge. I ordered four caps in my purchase. None came with insignia (I was really hoping I'd get at least one!) and two came with the front strap (for the others, one looks like it was removed, and the last has no buttons to attach one at all). Three were in good condition but the last was not, with a very damaged visor--though who knows, it could have simply been damaged in shipping. This last hat, while printed as size 57 like the others, was in fact much smaller, making it useless. For the dollar each I paid, it was still a good deal. I ordered 2 size 60, 1 was far too small, the other fitted me ok though i wouldn't mind trying a size larger, the one that fitted me had the strap, neither had the badge! Buy a few and you can't go wrong! With the flaps down I think these look like the caps from Alien Covenant! I bought two of these, and, lucky me, one came with insignia and one without. However, even more interestinf, on of the caps was dated in the same year this camo pattern was introduced, lucky me again. These caps, while nothing that would be made today, are both snug, very useful, and ludicrously cheap. Buy one! Bought 3. The 59 was to small ( so I gave it to my girlfriend) but the two 60's fitted fine. Always upsize with these. None of them had the insignia or the strap. I would moan, but at a Euro a shot for an all cotton cap? Can't go wrong, as long as you get the right size! These are considerably smaller than the listed size would indicate. Order one or TWO sizes larger than normal. All were in pristine condition but none came with the cap insignia unfortunately. Sized appropriately and like new. I tend not to like this short style cap, so these will be given away. If you like the short style cap, you will like these for sure. Quality and description are perfect. Seems to run on the small size... by a large margin. Still, I get to make my niece look like a dork, which is a great investment for less than a dollar! Niceish cap. I had bought one of the last ones, not knowing about its chronic sizing problem in where it seemed to be several sizes too small. Didn't come with the cockade or strap, which was quite disappointing. If you're just looking for some Strichtarn for your collection, I guess you can't go wrong. Would buy another it if there was a restock of larger sizes. I got my cap a couple years ago, just got it to spend an extra EUR. Oh God, little would I knew, it would be one of the best purchases ever. The cap fitted like custom made, and even if it didn´t have the insignia, made me look stupid enough to loose all my charisma, inteligence and luck points, but hey, all those flaps did help when I had to fight off some bees in the yard, as a piece of my DIY bee fighting costume. Do buy one. I got my cap a couple years ago, just got it to spend an extra EUR. Oh God, little would I knew, it would be one of the best purchases ever. The cap fittet like custom made, and even if it didn´t have the insignia, made me look stupid enough to loose all my charisma, inteligence and luck points, but hey, all those flaps did help when I had to fight off some bees in the yard, as a piece of my DIY bee fighting costume. Do buy one.